Hello Spring, hello dirt! It’s lurking everywhere in your home. It’s trying to hide but it’s not doing a very good job. Let’s just give our houses a deep clean and get it over with, right? This is not as daunting as it seems, trust me. Unless you live in some sort of mega mansion. But if you do, I’m assuming you can probably afford to hire a cleaning service. For me, a cleaning service is just not in the budget these days. But I think I may have the second best thing. 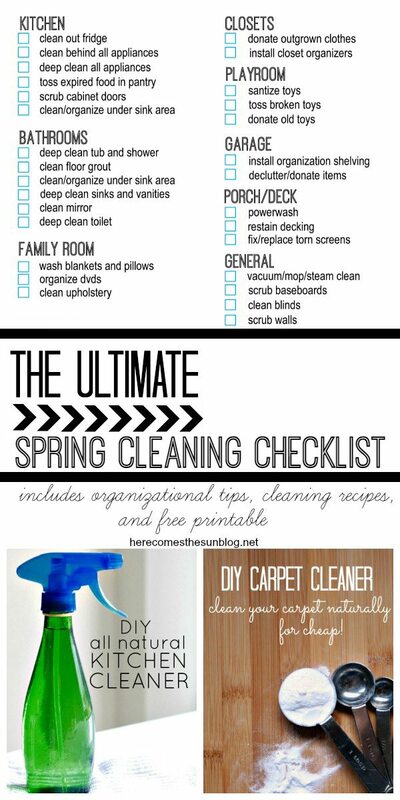 … a The Ultimate Spring Cleaning Checklist that lays out exactly what should be tackled. Treat this checklist as sort of a guide. You don’t want to do it all… no problem. Honestly, I’m probably not going to get around to doing all of it. But I’m definitely going to try to tackle a good portion of it. There’s probably some tasks that I left off. Like clean your movie theater room or your solarium that houses your pool or maybe you need to clean that guest house on your property. And just so you know, I’ll be visiting you soon and taking advantage of that movie theater and pool that you have. And your guest house. But I promise I’ll clean up after myself. You know that I love you all so I’m offering this printable for download (for free, of course). 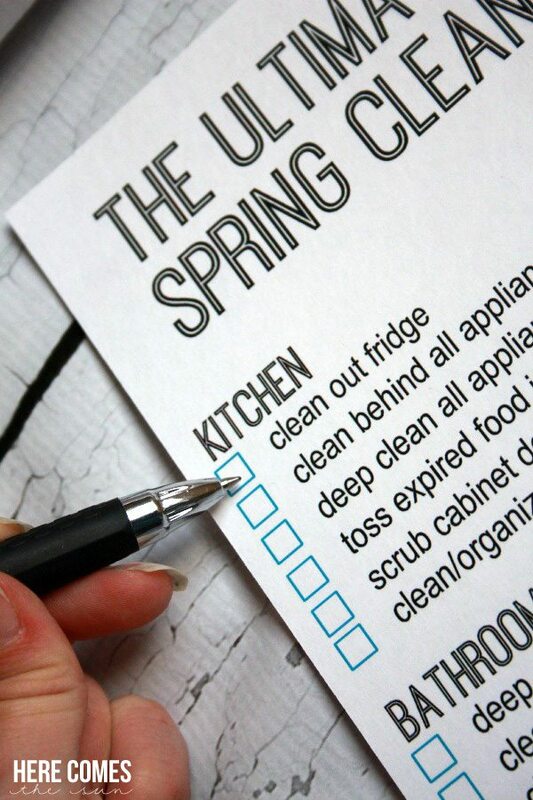 Download your ULTIMATE SPRING CLEANING CHECKLIST HERE! Just do me a favor… will you tell your friends that you found the most amazing Ultimate Spring Checklist printable here and that they need to stop by like RIGHT.NOW and get it? Thanks bunches! If you need help getting started, here are ways to organize your closets, kids’s toys, and garage. A great garage organization tool is this diy bike rack. Also be sure to download my free chalkboard pantry labels and get recipes for all natural kitchen cleaner and carpet cleaner.